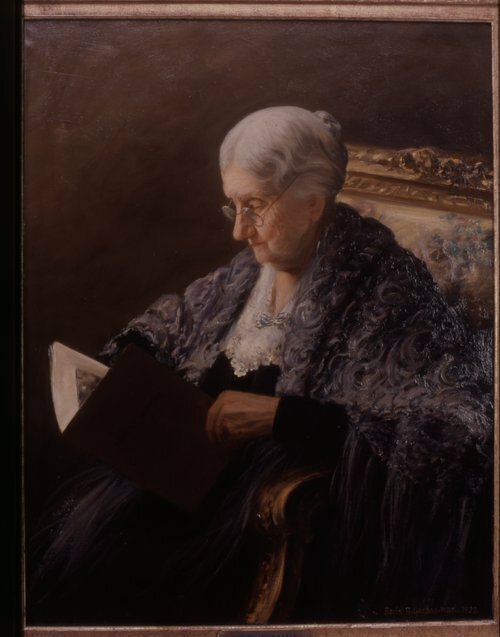 Oil painting of Betty Kohn Wollman (1836-1927) done by artist, Boris Barnhard Gordon (1890-1976). Jonas and Betty Wollman were early settlers in Leavenworth, Kansas, known for their anti-slavery views. The Wollmans hosted a dinner for Abraham Lincoln during his visit to Leavenworth in December 1859. Late in life, Betty Wollman assisted in the model selection for the "Pioneer Woman" statue in Ponca City, Oklahoma.